The first Tonkin that I can trace back to is my great x6 grandfather John Tonkin, who married Charity Capell at St. Columb Major in 1770. *I have a lot of info on Charity's family, the CAPELL family, going back to the mid 17th century. John was buried at St. Columb Major on 12th March 1818. 2. Nicholas (bp. 19th Aug 1797) - still alive on 1881 census. 3. Robert (1801-1881), aged 79. 4. William (bp. 21st Nov 1803) - still alive on 1881 census. 5. Joanna (bp. 5th April 1806) - still alive on 1881 census. 8. Sarah (bp. 1819) - still alive on 1881 census. Nicholas died on 8th May 1840. His wife Joan was living with her daughter Sarah, and Sarah's husband Richard Veal in St. Columb Major, along with Sarah's children. By 1851, the family were living in St. Ervan, Joan was 76 years old, still living with Sarah and Richard. By 1861 Joan was living back in St. Columb Major, she was listed as Joanna Tonkin, 86, widow. She must have died soon after. 1. Elizabeth Rowe (1824-1900), aged 76. *unmarried. 3. William (1828-30), aged 1. 4. William (1831-1881), aged 50. 5. Mary Rowe (1834-1919), aged 84. 7. Jane (1840-1913), aged 72. 8. Nicholas (1843-1932), aged 89. Christiana Parson Boarder 31 U Dressmaker St. Coverack? Robert died on 11th June 1881, aged 79. 4. 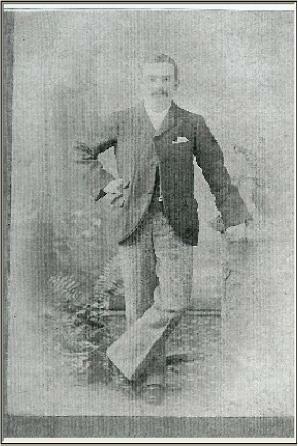 Nicholas Tonkin was born on 22nd June 1843 at St. Columb Major, the youngest child to Robert and Betty. He apparently didn't get on too well with his father, as Robert liked to ride with the hounds, enjoying a country gentleman's lifestyle - when he couldn't afford to do so. Nicholas went to live with his sister Mary and her husband James Trebilcock, who ran the grocer shop in Camborne. 1. Nicholas George (1868-1923), aged 55. 2. Elizabeth Mary (Minnie) (1869-1958), aged 88. 4. Martha Ellen (Moshy) (1873-1944), aged 71. 5. Katie (1875-1938), aged 63. 7. Louisa (Louie) (1880-1975), aged 94. 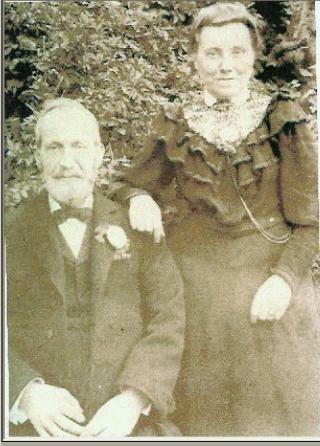 Nicholas had many grandchildren, his daughter Minnie married William Whear in 1886, and had her first two children in Hayle, Cornwall in 1888 and 1891. They then emmigrated to Philadelphia, USA and had another 9 children, 5 of which died young. His eldest son married Emily Trebilcock (who was his cousin, the daughter of Nicholas' sister Mary). They had 5 children. Carrie and her husband Tom Mills also had 5 children, both Katie and William had 4 children each, Louisa had 2 and Moshy had 1 daughter. *For more info on the grandchildren of Nicholas & Caroline go to their special page*. 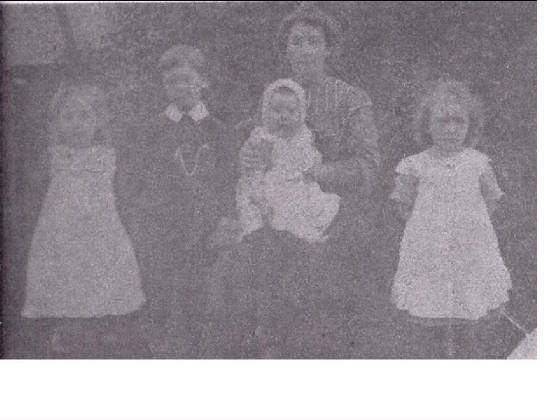 Caroline only saw two or three of her grandchildren, as she died on 7th July 1894, aged 54. Sometime afterwards, Nicholas married Mary Elizabeth (Betty) Berriman, who was 20 years younger than him. She was known as 'Aunty Mary' by some of Nicholas' grandchildren. They had no children, Nicholas passed away on 21st December 1932, aged 89 years old. 'Aunt Mary' died on 29th December 1936, aged 73 years. She was buried at Towednack on 2nd January 1937. 1. James Colin (1902-1970), aged 67. 2. Evelyn (1904-1928), aged 24. 3. Kathleen Hazel (1905-1991), aged 86. 4. Phyllis Dorothy (1908-1999), aged 91. Soon after their last child was born, Benjamin came down with manic depression, after being thrown from his horse and cart on the Hayle Causeway. He was sent to Bodmin Mental Hospital, where he was well enough to work as a decorator and gardener. His son Colin used to visit him with parcels, but apparently he didn't want his daughters and grandchildren to visit him there. My Aunt Dorothy once told me she first met Benjamin (her father) when she was 17. Katie had to work in the ammunitions factory to earn money, and have soldiers billeted at her house. 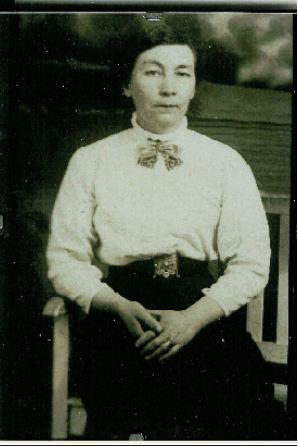 Her brother William, who owned Tonkin's bakery in Camborne, supplied her with free bread and cakes. Still, it must have been a struggle. She passed away at the age of 63, on 29th April 1938. Ben outlived her, dying on 14th November 1942, aged 69. She is buried with her parents, Nicholas and Caroline at Phillack. Ben was buried with one of his sisters at St. Erth.